After founding Brazil’s concrete poetry movement in the 1950s with his brother, Augusto de Campos became increasingly interested in the visual aspects of poetry. 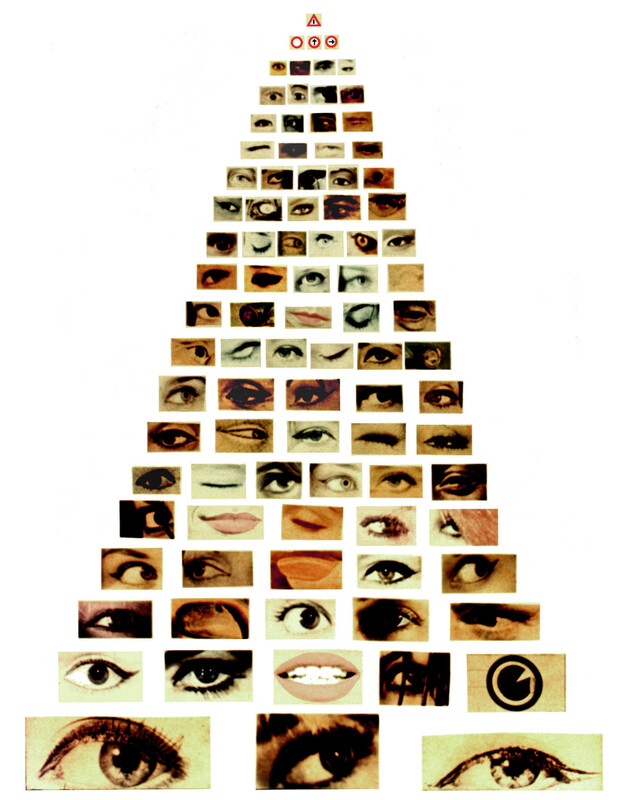 “Eye for Eye” is a pop-concrete concoction that subverts an optometrist’s eye chart by using pictures of actual eyes and playing with proportion; the chart’s lines grow gradually larger with the very top line almost inscrutable (a visual pun: the letter I enclosed in a red triangle) and the bottom lines made of easy-to-see eyeballs (although Brigitte Bardot’s lips make an appearance in the penultimate row next to Elizabeth Taylor’s heavily mascara’d oculus). Not just a literal eye chart, de Campos includes lips and fingernails which, in this context, begin to look like the eyes surrounding them. A reference sheet to the various body parts can be found here. You are currently browsing entries tagged with augusto de campos at Ondioline.